No one should have to lose someone they love to breast cancer. At Breast Cancer Now, we’re determined to stop this disease, once and for all. And research is how we’ll make it happen. Your Fund in Memory will be a lifeline for research – and the loved one it celebrates will be part of every breakthrough and every discovery. The money you raise in their name will help develop the treatments we need to make sure breast cancer never takes another life. It’ll also make sure scientists can continue to investigate the causes of breast cancer, so we can find ways to prevent it. You can read more about the kind of projects you’ll be funding below. Secondary breast cancer, when breast cancer has spread from the breast, causes almost all deaths from breast cancer. 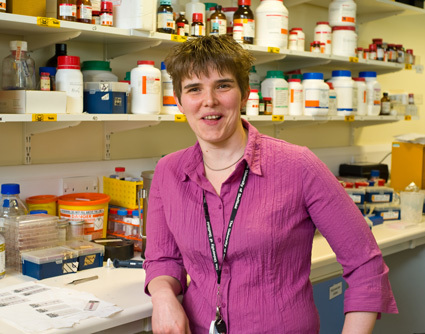 Dr Gartland and colleagues will investigate how certain molecules enable the spread of cancer to the bones. Triple negative breast cancer is a form of the disease which has limited treatment options because it cannot be treated using targeted therapies available for other types of breast cancer. 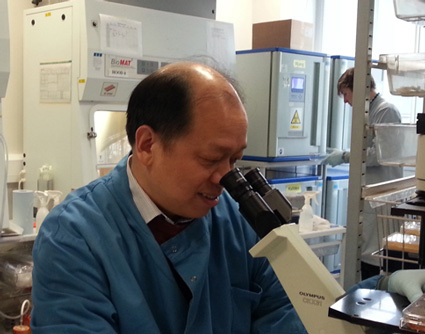 Dr Wang believes that the way that viruses attack the body could be used to develop a cancer treatment. By supporting research projects like mine you’ll be helping to stop breast cancer in its tracks.